Bucky Barnes was Captain America's sidekick during world war II, donning a red, blue, and white outfit to mirror the Super Soldier in every way. He was trite and somewhat dull, but later on he was fleshed out and was even given his own story arc called: Winter Soldier. I don't know anything about that story arc aside from the fact that it did bring Bucky back up to date and eventually becoming Captain America. I'm not sure where the movie stands but… here's the figure. Is it good? 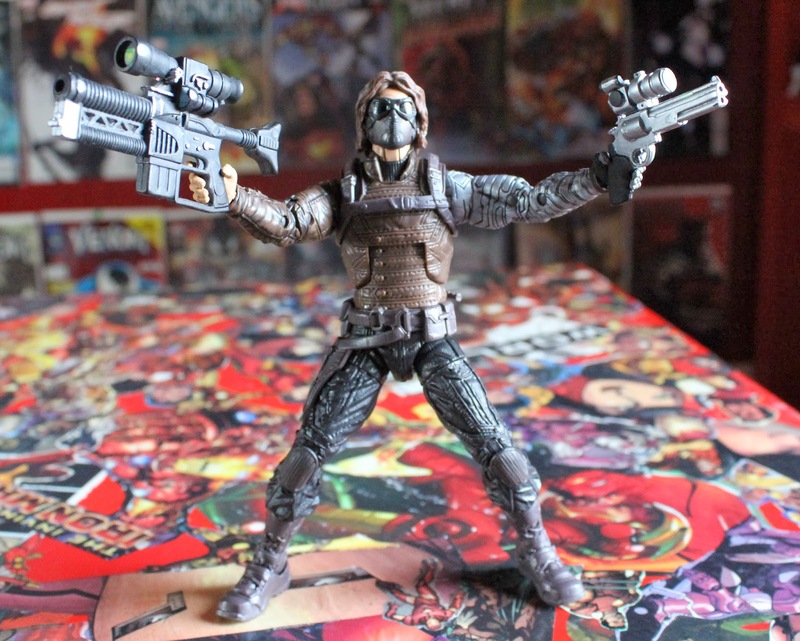 Winter Soldier is part of wave 2 of the Mandroid BAF. He was pretty much kept in the 'dark' because he is movie related and I suppose Hasbro didn't want to be part of the spoiling crew. Though Capt. Steve Rogers, Black Widow, and of course Winter Soldier are a no brainer character to appear in the movie so I don't know what was the point of being secretive about the last three. I honestly didn't think the design was all that at first. Another man with a cyborg arm that somehow transcended time to rejoin his fellow soldier in the present 616, only this time as an enemy and not as comrade in arms. Transferring him to a movie is seamless enough in terms of design. He looks like the Winter Soldier comic book version and being an action figure, I'm astonished at just how much I truly like the details put on him. The sculpting has a lot of work into it that shows that Hasbro is trying harder than they were before. There are wrinkles, better shading, and the body mold offers a lot and goes in scale with the rest of the movie based action figures. 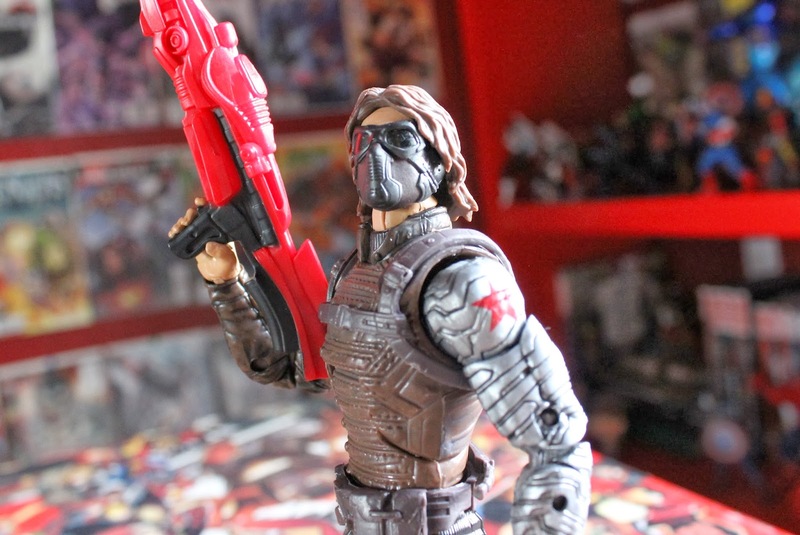 The colors(paint details is still not Hasbro's strongest suit but I can't admonish them 100% on that) are dark and truly adheres to the Winter Soldier. Not having seen the movie yet but seen enough previews, I do know that this could be one of the most accurate movie figures I have seen. Accessory wise, well, he plummets. He has the Mandroid leg and he comes with an alternate head but he is missing closed fists on his metal arm that would've been a really cool movie/comic to action figure fighting scene! Oh and that terrible red gun! Hasbro! What are you guys doing with the weapons this round!? What about those guns in the first pic? Those are some spare paraphernalia from owning a lot of loose figures form the past. They fit quite well with the Winter Soldier don't they? So if we talk about the face swap, yes, he doesn't look like the actor at all! The masked face is quite awesome though! For those who of you who aren't familiar with Bucky as the Winter Soldier and as Bucky(the side kick), he wears a Robin mask! Errr, yeah. The black paint/burn must be the homage to that abhorrent little 'disguise' I suppose! He has a pretty damn good articulation to say the least. Standard of what to expect and he looks good with guns! One thing I did forget to mention about details is that there are molded weapons on his belt and holsters! MOLDED WEAPONS! RED GUNS! So yeah, I'm glad I have these extra guns lying around! At any rate, there isn't a whole lot to say about articulation since it is good! I didn't do a whole lot with his posing, but hey, I could later on! 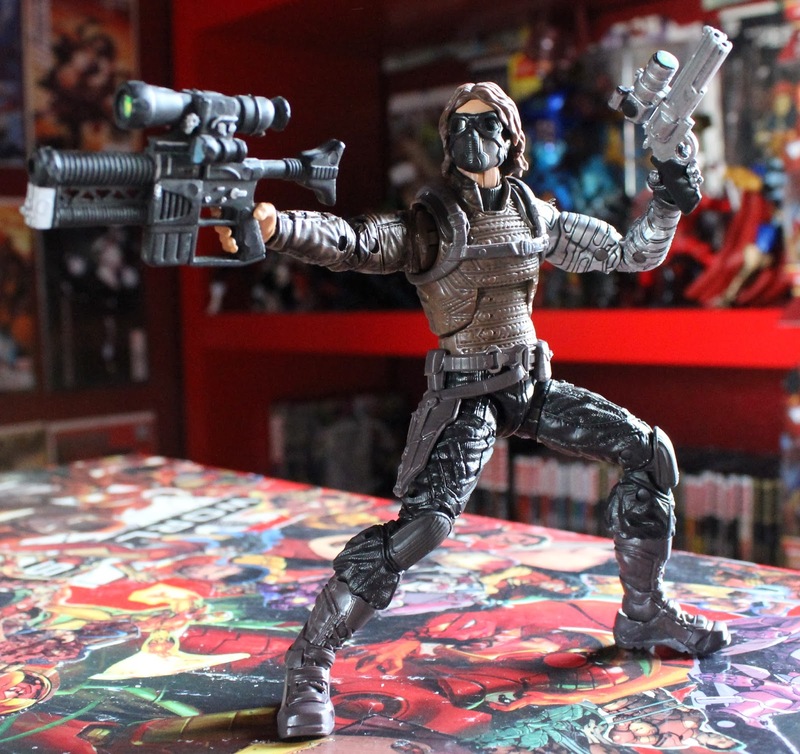 My major complaint with Winter Soldier is the lack of weapon and that trend of molded weapons in this wave! But if I am to just judge him on detail and surprise value, yeah this guy packs a wallop! He comes with the Mandroid leg so he has some other incentives for all your BAF adamants out there! But do not erroneously take this figure as just mediocre because he has something to offer! Favorite Legend? No, not at all, BUT he does offer something far more than I thought he would so I suppose low expectation had a hand in that!